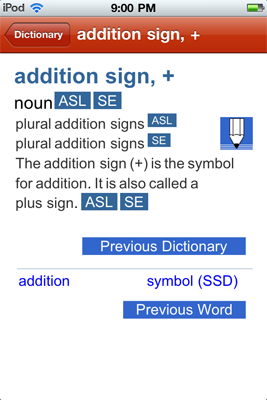 The Signing Math Dictionary (SMD) is one in a series of illustrated, interactive 3D sign language dictionaries and pictionaries. The SMD is designed for grade 4-8 students who are Deaf or Hard-of-Hearing and use American Sign Language (ASL) or Signed English (SE) in the classroom. The SMD supports access to standards-based math content among elementary and middle school students and is a great resource for teachers and parents! Our 3D character can be zoomed in or out and rotated to give you the best vantage point for every sign. YOU control the placement of the character - not us! The dictionary contains 705 math terms and will link to definitions in other dictionaries and pictionaries from our series. 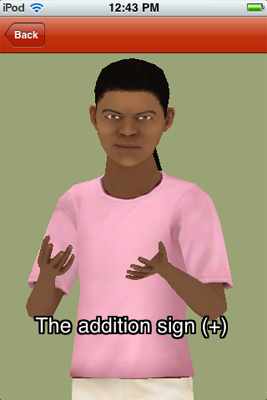 Use the controls to choose the sign language you prefer; view the illustration; speed up or slow down the signing; and send the character to his "home" or default position. The signing will automatically loop until you go back (using the "back" arrow in the top left corner), thereby exiting from the signing page. Text and illustrations were developed by and are copyrighted by TERC, Cambridge, Massachusetts. ©TERC, Inc. All rights reserved. SigningAvatar® animation technology and mobile interface were designed, developed and are copyrighted by Vcom3D, Inc. ©Vcom3D, Inc. All rights reserved. Any reproduction in while or in part is strictly prohibited. 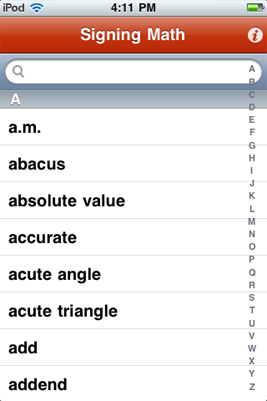 The Signing Math Dictionary for iPod Touch/iPhone is developed by TERC and Vcom3D and funded in part by the National Science Foundation, Grant HRD-0833969. All opinions, findings, conclusions, and recommendations expressed herein are those of the authors and do not necessarily reflect the views of the funders. Jana Borgen, Illustrator; Ronit Carter, Formative Evaluator; Wesley Fleming, Senior Web Programmer; Greg Kuchmek, Senior Web Designer and Illustrator; Tara Robillard, Research Associate; Laura Uhl, Editor. Cindy Barson, Manager, Signing Products and Products; Salam Daher, Digital Media Software Developer; Jessica DeBusk, Intern; Glenda Freeman, Consultant; Michael Freeman, 3d Artist/Animator; Megan Helock, Intern; Lauren Jarrard, Digital Media Software Developer; Iris Kinley, Consultant; Tu Lam, Chief Software Developer; Ashley Loomis, Intern; Todd Palamar, Technical Director; Dan Silvergate, Director of Software and Graphics; Ed Sims, Chief Technology Officer; Teresa Thomasson, Animator/Graphic Artist; Valerie Wilson, Deaf Education Specialist; Matt Weaver, Lead Software Developer.